If you use QuickBooks Online, you should be familiar with creating Estimates. An estimate is a list of items and costs for a job you'll perform for a customer. The great thing about Method is its two-way sync with QuickBooks Online. With our sync, any user with the given permissions can create an Estimate (as well as other transactions), and it will sync immediately to QuickBooks. Your Method user does not have to have access to your QuickBooks account at all. In our last article of our onboarding series, we created a lead as well as related activities to keep track of our interactions with her. In this article, we will create a new estimate for her as well. When viewing your lead, you will see the estimates associated with this customer in the App Ribbon. We will start from here. 1 . Click ⊕ New in the App Ribbon besides Estimates. This will open up the New Estimate Screen. Note the Customer name is the customer name as it is viewed in QuickBooks Online. In our scenario, the customer name used the company name, not the first and last name. Also note that the estimate can have related activities, however, these activities are not associated with the contact. They are only for the estimate itself. 2. The next few fields for the Estimate are fields you may be familiar with if you use QuickBooks Online. The only required field here is the estimate date. The fields marked in green are specific to Method. Assigned To - You can assign transactions to Method Users. Tags - Used to categorize your estimates. Opportunity - You can associate this estimate with an opportunity (which will be covered in later). 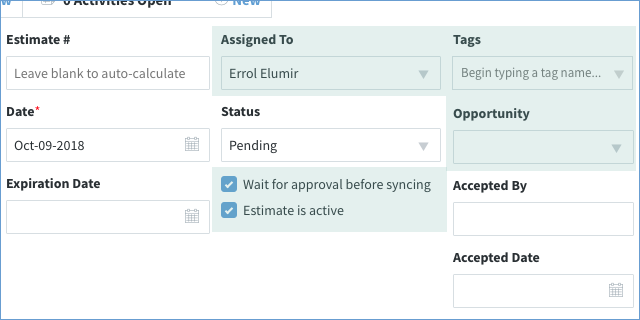 Wait for approval before syncing - This indicates the estimate will not sync to QuickBooks. Since the customer is a lead and doesn't sync, it would make sense that her transactions don't sync. 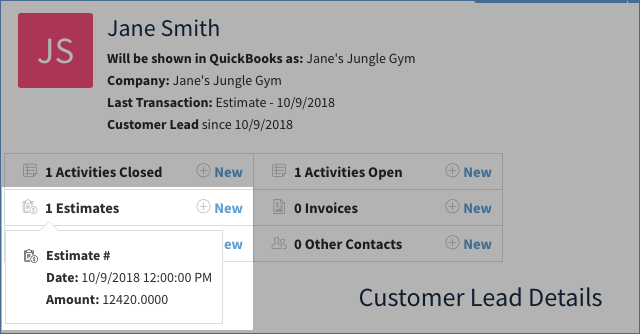 However, if you were to uncheck and save this estimate so it does sync to QuickBooks, then the Customer Lead will automatically convert and also sync to QuickBooks. 3. 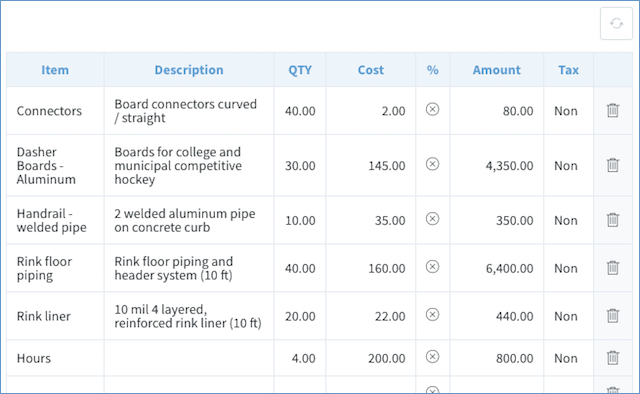 The item line grid holds the items for this estimate. Click inside the grid and add some items to this grid. In our example scenario, we quoted an ice rink job. 4. Click Save at the bottom of the screen. This will save your Estimate and update the totals for the Estimate. Email - Send an email with a link to a personalized portal for the customer. This portal will contain their transactions. 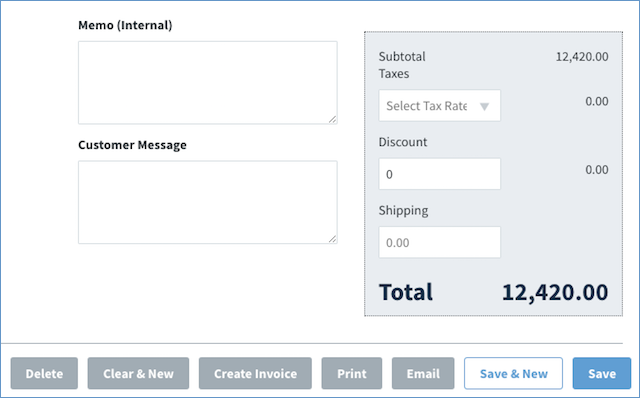 Create Invoice - This will create an invoice from the estimate, copying the line items and and other transaction information. Congratulations! You've created your first Estimate! Let's go back to your lead. 1. Select the Customer name in the header. This will take you back to the contacts view for this customer. 2. Back in the Contacts view, you will see the estimate you created in the App Ribbon. By selecting the Estimate in the App Ribbon, you will see a short summary of it. This concludes creating an estimate for your contact! If you are following along, you may be wondering why the estimate hasn't synced to QuickBooks online like we promised, however, remember, the customer is currently a lead, and thus will not sync. Now, if you are a sales representative or a sales manager, you may want to know how to encapsulate all that you learned within the Sales Opportunities App. Fortunately, we have you covered, so please see our next article Onboarding - Create an Opportunity.